Columbus Blue Jackets goalie Mike McKenna (30) looks for the puck during the second period against the Buffalo Sabres at First Niagara Center. Mike McKenna was an econ major at St. Lawrence University, but he’ll tell you one of his favorite elective courses there was stagecraft. You know, hanging lighting, building sets, rigging scenery, and all of those other behind-the-scenes efforts that help make a great theater production great. Fitting in a way, then, that the Columbus goaltender was hanging out on the Blue Jackets bench at Madison Square Garden, in the shadow of Broadway Thursday night, when the call came to step out from behind the curtain and go center stage. Starting goalie Curtis McElhinney was hurt making a save in the first period against the Rangers and wasn’t able to come back out for the second. So, for the first time in over three years, the 30-year-old native of St. Louis was about to face NHL shooters for real. It was only the 18th NHL appearance for McKenna in his nine-year pro career. Given that, how in the world did he look so calm coming in cold to a critical divisional game, being played in the “World’s Most Famous Arena?” Because, he says, the stakes may have been different, but it was still just hockey. When he came into the game the Blue Jackets were up 3-1, and 40 minutes later McKenna and his teammates were celebrating a 4-2 victory, the Blue Jackets fourth in the past five games. After waiting so long for another NHL chance, what was his reaction when the final horn sounded? For the guy that has stuck with it so long, playing so many years in so many cities — mostly in the American Hockey League — it was also sweet affirmation for having the belief in himself and the willingness to stick with it. “You work as hard as you can to get to this level. It’s easy when you get to 26, 27, 28, when things aren’t going your way, you see guys that go to Europe, or they kind of give up on what they’re doing,” he explained. He’s certainly going to get the chance. 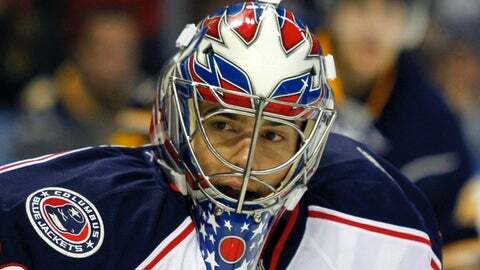 McElhinney’s injury isn’t thought to be serious, but the Blue Jackets recalled goaltender Jeremy Smith from Springfield of the AHL to back up McKenna, who is — at least for the time being – the team’s number-one netminder. Honestly, who wrote this script? Journeyman goaltender hangs in there, constantly honing his game while he waits for another chance to play it at its highest level. Unexpectedly, he gets that chance, steps onto the stage and into the spotlight and steals the scene. And that was only the first act. Better get back to your seats; the curtain is about to rise for Act Two.